PRINCE GEORGE, B.C. -- Residents of a tiny northwestern British Columbia town ravaged by a massive wildfire are determined to extinguish the flames and rebuild their community, family members say. Dan Edzerza Sr. and his daughter Kristina Michaud are collecting donations of money and dried goods for evacuees after a 360-square-kilometre blaze destroyed more than 40 homes and properties in Telegraph Creek. "There's been a lot of devastation there," said Edzerza, speaking from Prince George, B.C. "A lot of my family members lost their homes. It's still not over yet, they're still trying to stop that fire." The provincial government declared a state of emergency Wednesday as more than 560 wildfires burn in every corner of the province. Residents of about 1,500 properties have been forced to evacuate, while thousands more are on evacuation alerts and must be prepared to leave at a moment's notice. A new evacuation alert was issued late Thursday for the entire city of Kimberley and other properties directly south and southwest of the city in the Regional District East Kootenay. The southeast B.C. city has about 4,500 residents. Mayor Don McCormick said in a statement that if an evacuation is needed, residents will be given as much advance notice as possible, but cautioned there may be limited notice due to changing conditions. Two evacuation orders were issued earlier in the evening. One posted by the Cariboo Regional District covering 62 properties in the Dean River North area, including the Itcha Ilgachuz Provincial Park. The other covers 65 addresses east of Kootenay in the St. Mary's Lake area. Many people connected to Telegraph Creek are pitching in to help those displaced and save the town. Edzerza's son is among those fighting the fire in Telegraph Creek, while Michaud's sister is collecting donations in nearby Dease Lake. "That's their home. They're going to go back and set up tents if they have to," said Michaud. "We're going to do everything we can to make sure they have a home to go back to. That land is our roots." Smoke has triggered air quality advisories across Western Canada, and Michaud said it was so smoky in Prince George that it was dark at 6 p.m. on Wednesday. When she went looking for masks, they were sold out everywhere. "It's just awful here," she said. About 250 members of the Tahltan Nation and non-Indigenous residents live in Telegraph Creek. All have been evacuated, but some members of the First Nation have stayed behind to fight the fires, said Chief Rick Mclean. Most Tahltan members who lost homes have been notified, he said, adding about 21 of the destroyed structures are on the reserve. "It's heart-wrenching and worrisome, thinking about how we're going to rebuild," he said. "It's going to take some time. There's a lot of work that needs to be done to make it safe. We're still under evacuation order and fighting the fight." 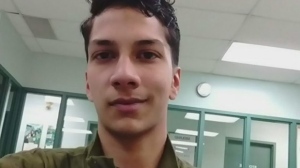 The federal government has promised to send 200 Canadian Armed Forces members to B.C. to help. A first team of 100 was deployed early Thursday to an area west of Kelowna to start the mop-up of contained fires. 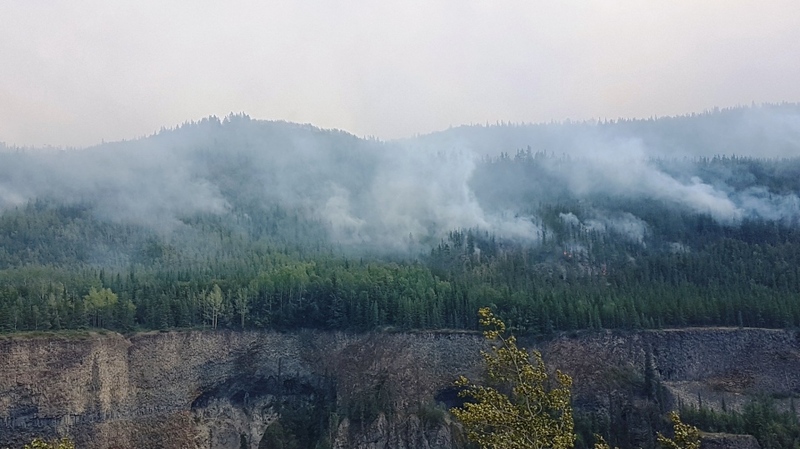 The Department of National Defence said it's still working with the BC Wildfire Service to determine where and when the other troops will be needed. Fire crews from across the province are also pitching in to fight the flames. Vancouver Fire Chief Darrell Reid said on social media Thursday that city fire trucks and crews were on their way north to Fort St. James. The fire vehicles will be shipped on flatbed trucks for the 15-hour journey, he said. Thirty-six new fires started between Wednesday morning and Thursday afternoon, mostly sparked by lightning, said wildfire service spokeswoman Kyla Fraser. The greatest area of concern is a corridor between Smithers and Prince George in north-central B.C., where many of the biggest fires are burning, she said. A wildfire about 30 kilometres northeast of Burns Lake has doubled in size in recent days to 680 square kilometres, making it the largest in the province. There are 113 firefighters battling the blaze along with support workers, aircraft and heavy equipment, said Fraser. As for the fire in Telegraph Creek, crews are facing difficult weather including hot, dry conditions and forecasted winds, she said. Erma Bourquin, a resident of Iskut, about three hours from Telegraph Creek, said about 90 evacuees from the town sought refuge in her community. About half of them have already moved on to other communities, she added. The air is so smoky there that one resident hasn't been able to leave her house for days because of her respiratory problems, Bourquin said. She said she's prepared to leave Iskut if an evacuation order is issued and has packed a bag with family photographs. "There are mixed emotions, some are hopeful," Bourquin said. "There are a lot who have fear, especially when it gets really smoky here. And it's a loss for some of (the evacuees) because some of them have lost their homes."